The Two of Cups shows the beauty and power that is created when two come together. 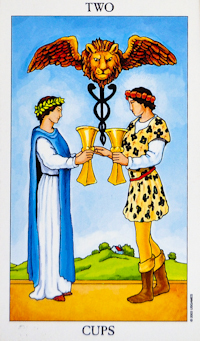 In some cases, the Two of Cups can refer to marriage, proposals and engagements, particularly as this card portrays what looks like a wedding or hand-fasting. It is a reflection of commitment between two individuals, to say that they will go through life together, always considerate of each other’s needs and wishes. In addition, the Two of Cups tells you to look for connections in your life, especially those that are one-on-one. Now is not the time to separate or stay apart. It is the time to join with another and work as a partnership. If you are in conflict, look for truce and the chance to forgive and be forgiven. If you are struggling with two choices or tendencies within yourself, seek to reconcile them. You are likely to be feeling “at one” with the energies of the universe and with yourself. This is one of the cards that represents the heart chakra and its’ opening. You should be feeling more than usually loving toward everyone and everything. Share that good energy, the world needs more of it! Celebrating a marriage or union, working together, sharing, calling a truce, coming to an agreement, declaring peace, forgiving and forgetting, having a positive response. Outside of love, the Two of Cups reflects a partnership of sorts, be it a business partnership, friendship or even a relationship between a person and their neighbor.